Skaters, cyclists, skateboarders and other young people who use Minster skatepark have created a new street-themed art mural with the help of professional artists. The event on September 22 was organised after PCSO Adrian Butterworth who had approached the skatepark’s owners, Minster Parish Council, to see if anything could be done to brighten up the area for the young people who use it. PCSO Butterworth said: “As part of my role, I’m keen to support initiatives which are beneficial to the community and provide a positive and safe environment for young people. 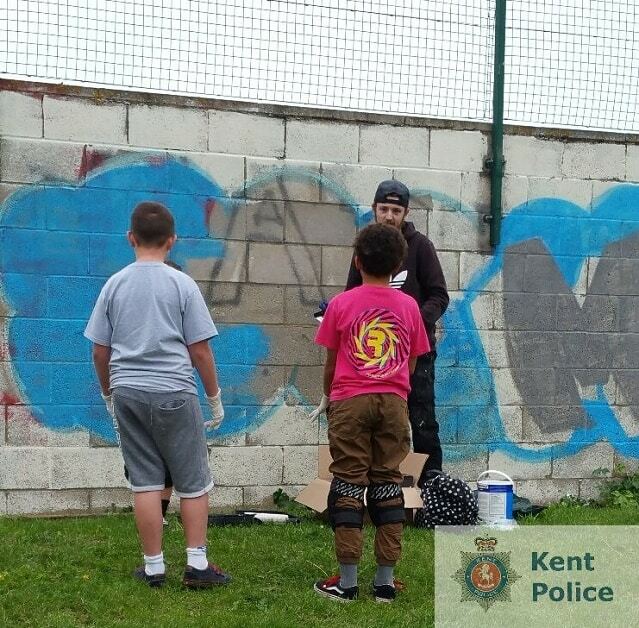 “While on patrol in Minster one day, I noticed the graffiti around the skatepark which was a mix of tags and abusive words. “While graffiti can be seen as part and parcel of having a skatepark, it hadn’t been done with the permission of the landowner, and didn’t really reflect the talented individuals who use the facility. 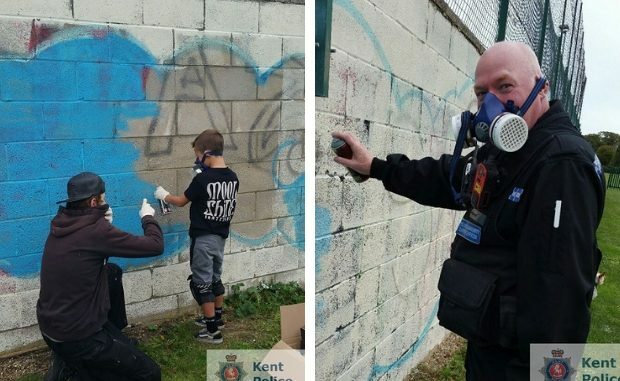 “With the full support of the parish council, we thought it was a good opportunity to ask young people to come forward to paint the area and make it their own. “Young people can make a positive mark in their communities and it’s important they are given the opportunity to do so and perhaps learn a new skill in the process. The team from Fixers were also on-hand at the event to guide the budding young artists in creating the mural, while refreshments were provided by the parish council. Bad weather later in the day stopped work on the mural, but brighter days over the weekend of 6 October meant the group could come back to finish the design. PCSO Butterworth added: “The day was a great success despite the rainy weather, with lots of people coming along to support it and mark their mark on the mural. The mural has been completed and I hope the users of the skatepark really feel proud of it.